This feature is an exploration of the area around Saxony's capital, including the Elbe Valley (please read excerpts of the article). 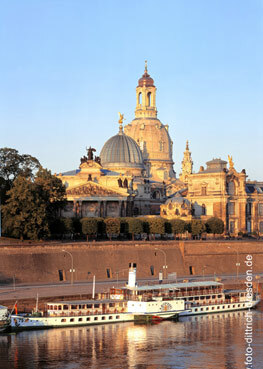 That is a stretch of castles and palaces along the river, including the restored heart of Dresden itself. The tour starts in porcelain city Meissen and sheds light on two inventions, both done in the Albrechtsburg castle: porcelain and the ribless cellular vault. The scenic drive ends in Zittau, where Germany, Poland and Czechia meet, with a incredible story about Zittau's famous Lent Cloth. On the way we visit walled Bautzen, meet the dinosaurs of late artist Franz Gruss and hike in the Elbsandsteingebirge with its table mountains and national park. 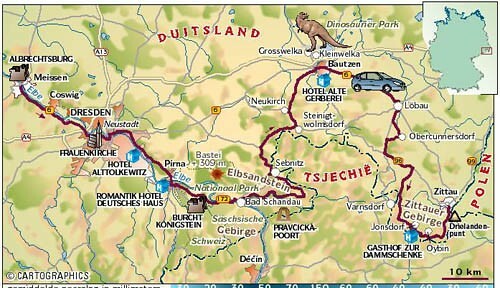 Map of the route of the scenic drive around Dresden, from Meißen via Dresden and Pirna to the Elbsandsteingebirge (Elbe Sandstone Mountains) and then to Bautzen, the dinoparks at Großwelka and Kleinwelka and finally through the Oberlausitz region to Zittau and its hills. This map is for indication purposes only. The copyright is owned by Cartographics in Holland. 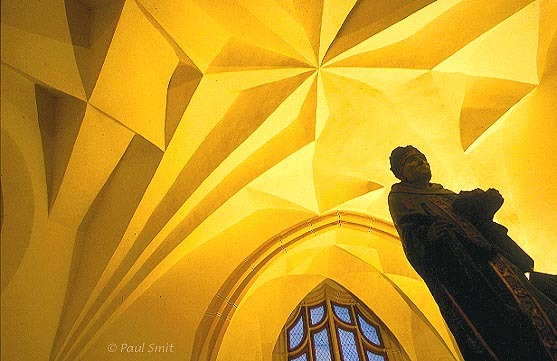 [GERMANY.SACHSEN 7297] 'Vaults like origami.' Ribless cellular vaults cover the halls of the Albrechtsburg in Meißen. In 1525 architect Arnold von Westfalen had nearly completed the construction of the castle. In the final stage he got the brilliant idea to leave out the ribs that the arches usually were anchored on. The vaults were to be self-supporting. This enabled faster building if the masons were very experienced. The result was a web of cell-vaults, unfolding in different patterns in each hall and looking like Japanese origami, elegant and seemingly weightless. Photo Paul Smit. [GERMANY.SACHSEN 7301] 'Secret of the Forest.' 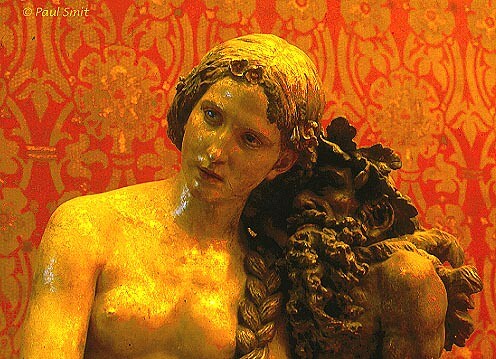 "Das Waldgeheimnis" (the secret of the forest), sculpture dating 1894 by Robert Dietz. It can be seen in the Albrechtsburg in Meißen. Photo Paul Smit. [GERMANY.SACHSEN 7304] 'Jachtschloss Moritzburg near Dresden.' 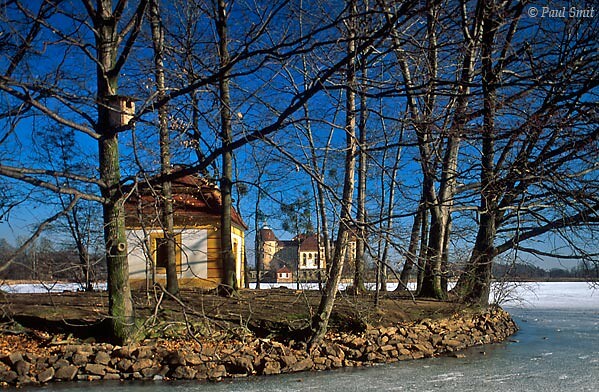 The baroque hunting lodge Moritzburg, situated northwest of Dresden, is surrounded by water in summer. During the winter this turns into ice, resulting in the palace being approachable not only across the bridge, but from all directions ... on skates! The castle and its park used to form the background for baroque parties, organized by August the Strong, elector of Saxonia. Photo Paul Smit. [GERMANY.SACHSEN 7316] 'Baroque fun.' 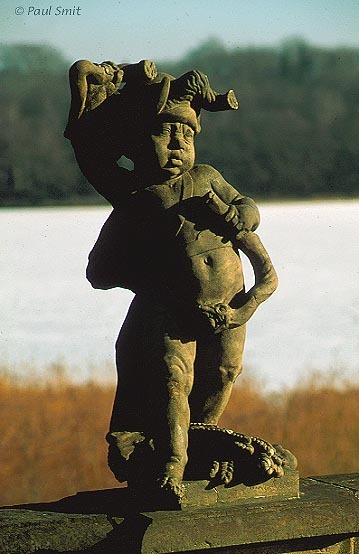 Sculpture in the garden of Schloß Moritzburg. Photo Paul Smit. 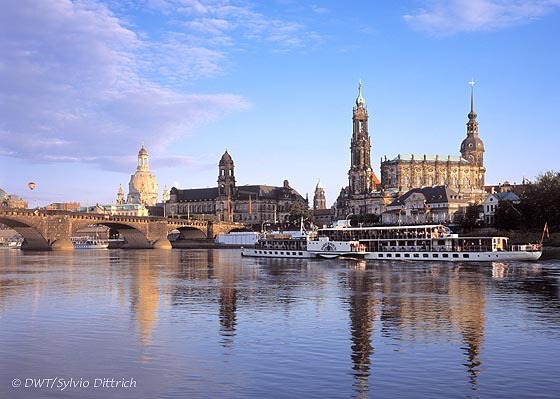 Since the reconstruction of the Frauenkirche, at left, Dresden's skyline along river Elbe has been completely restored. It looks again like the famous Italian artist Canaletto painted it. He did that more times than his beloved Florence. Since those days the Saxon capital proudly wears the nickname Elbe Florence, and it can do so again. Photo Sylvio Dittrich. (Attention: this picture is not made by us and is not included in any feature price arrangement by us. This photo can be obtained in high resolution at our collegue Sylvio Dittrich). 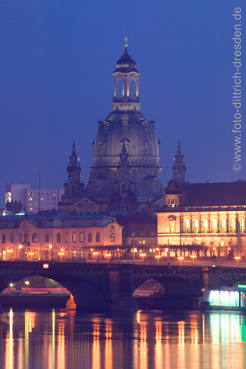 The majestic cupola of the Frauenkirche crowns the skyline of Dresden along the Elbe again, as if it has never been destroyed during the bombardment of 1945. Photo Sylvio Dittrich. (Attention: this picture is not made by us and is not included in any feature price arrangement by us. This photo can be obtained in high resolution at our collegue Sylvio Dittrich). 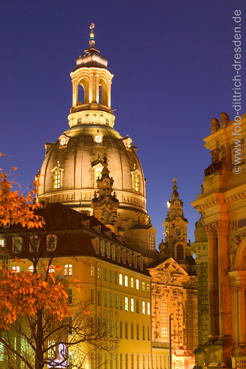 The majestic cupola of the Frauenkirche stands over the roofs of Dresden again, as if it has never been destroyed during the bombardment of 1945. Photo Sylvio Dittrich. (Attention: this picture is not made by us and is not included in any feature price arrangement by us. This photo can be obtained in high resolution at our collegue Sylvio Dittrich). 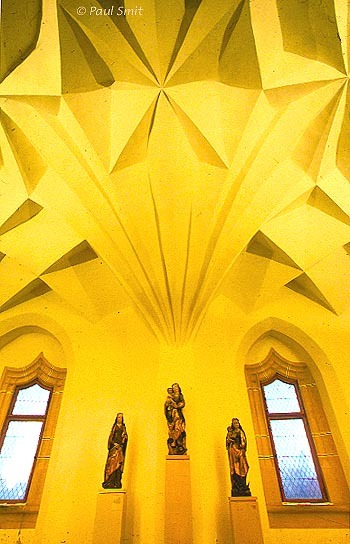 [GERMANY.SACHSEN 7295] 'Vaults like origami.' Ribless cellular vaults cover the halls of the Albrechtsburg in Meißen. In 1525 architect Arnold von Westfalen had nearly completed the construction of the castle. In the final stage he got the brilliant idea to leave out the ribs that the arches usually were anchored on. The vaults were to be self-supporting. This enabled faster building if the masons were very experienced. The result was a web of cell-vaults, unfolding in different patterns in each hall and looking like Japanese origami, elegant and seemingly weightless. Photo Paul Smit. [GERMANY.SACHSEN 7299] "I'm going to cry!" Late gothic sculpture in the Albrechtsburg in Meißen. 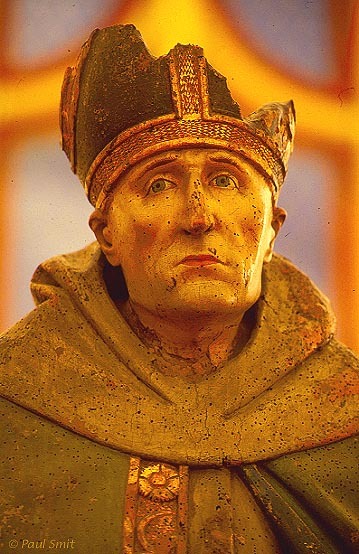 It looks like Saint Bonaventura wants to say: "I'm going to cry, they've shot my mitre into pieces." Photo Paul Smit. [GERMANY.SACHSEN 7311] 'Jachtschloss Moritzburg near Dresden.' 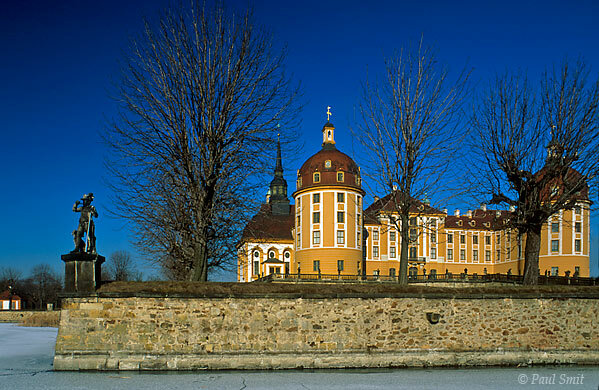 The baroque hunting lodge Moritzburg, situated northwest of Dresden, is surrounded by water in summer. During the winter this turns into ice, resulting in the palace being approachable not only across the bridge, but from all directions ... on skates! The castle and its park used to form the background for baroque parties, organized by August the Strong, elector of Saxonia. Photo Paul Smit. [GERMANY.SACHSEN 7314] 'Jachtschloss Moritzburg near Dresden.' 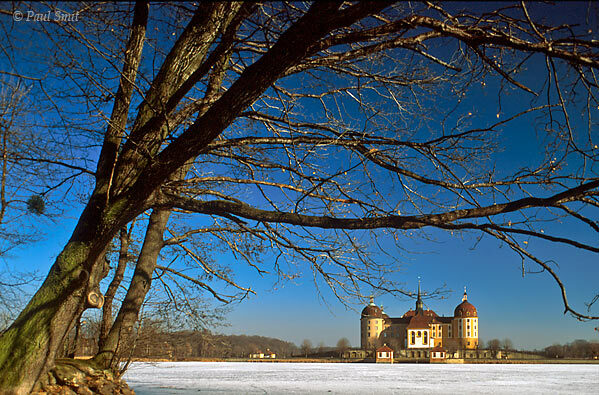 The baroque hunting lodge Moritzburg (in the distance), situated northwest of Dresden, is surrounded by water in summer. During the winter this turns into ice, resulting in the palace being approachable not only across the bridge, but from all directions ... on skates! The castle and its park used to form the background for baroque parties, organized by August the Strong, elector of Saxonia. Photo Paul Smit. [GERMANY.SACHSEN 7320] 'Room of the Prince.' 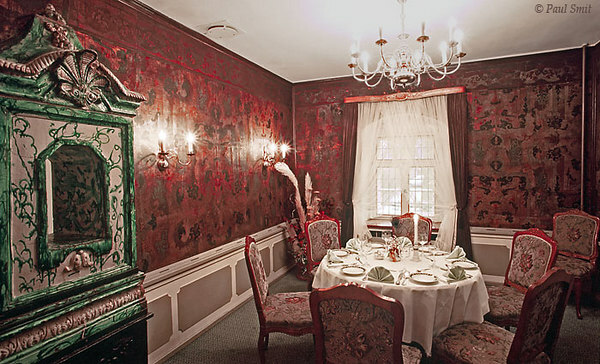 The 'Prinzenzimmer' in Hotel-Restaurant Waldschänke in Moritzburg near Dresden. Photo Paul Smit. 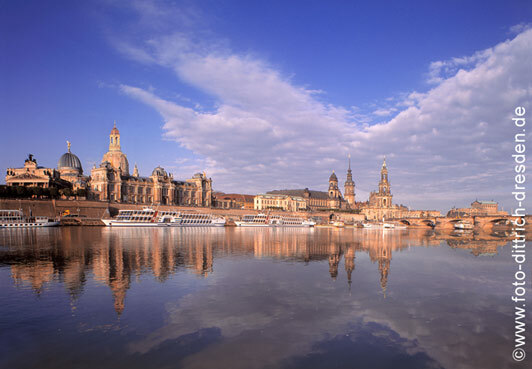 The baroque hunting lodge Moritzburg (in the distance), situated northwest of Dresden, is surrounded by water in summer. During the winter this turns into ice, resulting in the palace being approachable not only across the bridge, but from all directions ... on skates! The castle and its park used to form the background for baroque parties, organized by August the Strong, elector of Saxonia. Photo Paul Smit.